In the world of heavyweight cruisers, the competition is tough. Almost every manufacturer has an offering. The displacement wars have not let anyone rest. So into the big-league fray of the American market Victory Motorcycles continues to gain ground with their foot firmly in the door. New riders and veterans of the road are discovering the new American Motorcycle in greater numbers. So when MMM was offered a chance to ride the new Victory Kingpin Deluxe, we jumped at the chance. The Kingpin was introduced as part of the all-new line up for Victory in 2005. The center of these new models is their 100 cubic inch motor coupled to a six-speed transmission. Once the domain of only customs, these two items are the Victory’s indication that they intend to lead, not follow. The 100ci motor has its roots in the venerable 92 ci motor of Victory’s original bikes, some of which have over 100,000 miles under their belt. Chain-driven overhead cams run four valves per cylinder. Fuel is fed via fuel injection. From day one, Victory has delivered motorcycles with first-rate injection. The mapping and setup of the injection is spot on. This isn’t something you can say about every fuel injection bike. The styling of the motor has also been revised. The original motor had a look only an engineer could love. This new power plant is much more aesthetically pleasing. The power is ample to say the least. A mountain of low-end torque surges the bike forward with any throttle input. My lovely wife giggled every time I poured on the gas. I actually found it funny that they use a six-speed transmission; it’s unneeded. You could easily get away with only three gears given the power this motor puts out. Top gear is most certainly an overdrive for freeway cruising. Without the aid of a tach I couldn’t give specific rpms, but at 65mph in sixth gear, the motor was barely off idle. The transmission operates smoothly. Nice positive shifts, no heavy clunks or crashes. Shifting is done using a heel-toe shifter. It was well thought out by the engineers. No need to raise your foot to up-shift; the rear portion of the shifter resides at the level of the wide floorboards. Slide your foot back and step down; easy as pie. The final drive is a toothed belt, standard equipment for all Victory motorcycles. 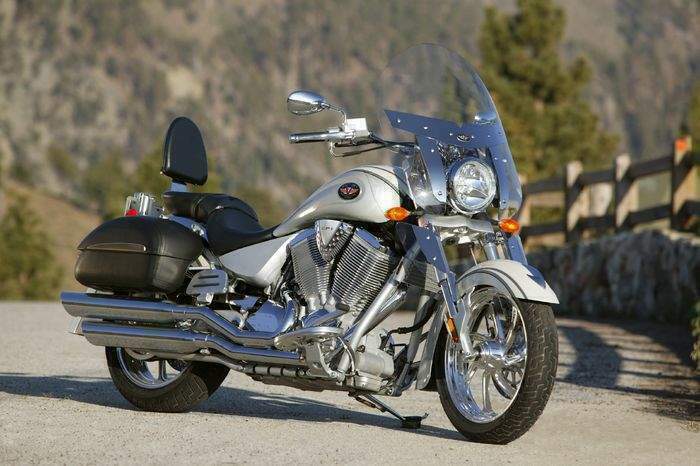 The Kingpin Deluxe is described by Victory as a light-touring motorcycle. With a windshield, lockable saddlebags and a passenger backrest standard, the Kingpin Deluxe has the tools needed to fit that role. The large windshield provides good weather protection and is easily removable when the mood strikes. The bags are lockable and covered with leather-patterned vinyl to give them a soft bag styling. Storage room was fair, at best. A trip to the grocery store showed they hold a little more than two loaves of bread, literally. Don’t expect to pack enough for a two-week sojourn across America in them; extra storage would be needed. The passenger accommodations are nice, including a backrest, wide seat, and floorboards. The deeply dished seat of the Kingpin is nice and firm. Unlike most seats, which try and sucker you in with ultra-soft padding, the Kingpin’s saddle is better than many. But the deeply dished shape locks you in to one seating position. That’s fine for 100 miles or so, but when you want to run longer, your backside will pay the price. For those wanting to go the long haul, an aftermarket seat will be a wise investment. The amount of time I was comfortable in the saddle did correspond well with the range of the gas tank. The gas light would flicker on after about 130 miles or so. Holding around 4.5 gallons, the tank includes a 1-gallon reserve. When you hit that last gallon, the yellow low fuel light reminds you to look for fuel. Comparing notes with fellow tester Editor Pearman, we saw similar mileages. Low 30’s to low 40’s depending on speed and how many “yee-haw” full power starts you did. The fit and finish of the bike is first rate and the long lines of the Kingpin are accented by many small touches, like the split back tank that flows right into the lines of the seat. A flush mounted rear taillight matches the curve of the rear fender. The aluminum rims are bright and stylish. These are all items you would often pay for, and pay dearly, to add to the competition’s machines. These thoughtful touches are found throughout the entire Victory line. You could buy a bike and spend a year accessorizing it, or you could buy a Victory and spend that year riding instead. Victory also is the first manufacturer to offer a true HID upgrade for their bikes and can be ordered from the factory. Our Deluxe came equipped with the HID low beam. It offers an improvement over conventional halogen lighting. Even slightly out of adjustment (the test bike’s light was aimed too low) the HID beam reached as far as the conventional halogen high beam; nice for those late night rides. I am amused that Victory is leading the way with this piece of technology. Even vaunted techno-junkies BMW are late to this party. Handling on the Kingpin Deluxe was very neutral. The long wheelbase and geometry provides a stable, well-planted feel. It will eat up easy sweepers like ice cream on a summer day. When the road gets really twisty, you may need to back off the throttle; the Kingpin was not completely at home here. Ground clearance was very reasonable. The front floorboards are the first hard part to touch, and allow enough lean to satisfy most riders. The front suspension is a robust, inverted fork that did a fine job soaking up most bumps. The rear suspension is a mono-shock hidden under the seat. It did let a few sharper bumps through, but was limited by the amount of travel in the rear suspension. The brakes were Victory’s usual strong, powerful discs. They offer good feel, and confidence inspiring power. At the end of the ride I came away really liking what the Kingpin Deluxe had to offer. Living in the tough world between full touring bikes and big-bore power cruisers, the Kingpin does a fine job of spanning both worlds. It has the equipment needed to you get where you need to go and can do it with style. A much more versatile bike than one might imagine, the rider wanting a bike that can fill multiple roles will find a good fit in the Kingpin Deluxe. I round the downhill left-hander while pouring on more throttle, trying to again enjoy the skr–sk –skrrrrr of the floorboard as it meets the pavement. As if in some sort of bad dream produced by the MSF, I come upon a school bus, backing out of a blind driveway. I feed some brake and the bike starts to right itself. I add more brake and we come to a safe stop. Am I aboard a fiery 600cc sportbike? No. I was enjoying a twisty road on a 2006 Victory Kingpin Deluxe. Victory builds this stylish bike for the occasional trip and weekend jaunt. The detachable bags and windscreen turn the standard Kingpin into a light-tourer. The Kingpin Deluxe looks good and is a blast to ride. The secret to the success of the new Victory bikes is the 100/6 motor. Victory continues to listen to their customers and tangibly improved their robust Freedom 1500 powerplant. The new engine is a fuel-injected, 50º 4-valve OHC V-twin displacing 100 cubic inches (1,634 cc) Victory claims over 100 foot-pounds of torque and over 80 horsepower (measured at the crank) While classically styled, it features modern engine architecture. Inside you’ll find hydraulic-adjusting cam chains and lifters, a gear primary drive, engine counter-balancer and air-and-oil cooling. All of these combine to make a quiet, powerful, reliable motor that requires little maintenance. The 100/6 motor has a bore and stroke of 101mm x 102mm. Compression is boosted to 9.8:1. To prevent knock, Victory recommends 91-octane gas. The engine brain seems able to automatically compensate for low-octane early-detonation by retarding ignition. Hobbits and other Luddites may grumble about increased fuel costs versus other cruisers that will run on pump swill, but power comes at a price. Fuel economy ranged from a disappointing 33.6 mpg during an afternoon of floorboard scraping to a pleasant 41.5 mpg achieved by trolling along at parade speeds. Fuel consumption is sensitive to engine speed. Burn through the corners at higher RPMs and your range will shrink. The reserve light stops the fun when it appears between 120 and 130 miles. As always, your mileage may vary. Equally as impressive is the 6-speed overdrive transmission, the only 6-speed to come standard from a major V-twin manufacturer. With six speeds, you are better able to keep the engine near peak torque. No matter the road speed, no matter the gear, the Kingpin dismisses all traffic offenders via its unlimited torque. I liked shifting the new 6-speed. Gears are selected with a consistent schnick. Not quite sportbike precise, but far better than most of the competition. I’ll never understand the deal with cruiser riders wanting to hear a clunk when they shift. In over 1,000 miles I experienced no missed shifts. Regular readers will thank me for not bitching about any difficulty finding neutral. There isn’t any. This gearbox is a beauty. I actually loved the heel-toe shifter. Unique to Victory, the heel portion extends past the trailing edge of the floorboard. In order to upshift you simply slide your foot back, press down and bring your boot back forward. The ball of your left foot never leaves the floorboard. Gone is the cumbersome “lift your foot completely off the board, find the shifter, stomp down, return foot to floorboard” silliness of most heel-toe setups. It is a subtle detail that reflects the engineering behind these bikes. Take your regular Kingpin; add windshield, bags and a backrest and you’ve built a Kingpin Deluxe. This is a decent light-tourer for most of our readers. If you want that stripped V-twin look, take the occasional trip, but don’t want the heft or bulk of a full-dresser the Kingpin Deluxe is your Victory. Both windshield and bags can be quickly and easily detached. When you are ready for a road trip, simply mount the windshield and bags, pack your gear and hit the road in style. I only encountered light drizzle on one day and the bags worked perfectly. My bakery goodies, MMM back issues and insurance paperwork stayed high and dry. Publisher Wanchena rode through an early May monsoon and noticed that the saddlebags leaked. Many if not most of our readers will park it when it rains that hard. If you are that much of a die-hard, then the Kingpin may not be your bike. The bags are a matter of perspective. If you want to commute on your Kingpin or do a weekend ride, they are adequate. For any serious, long-distance work they are on the small side. MMM staff are riders first and style mavens second…OK – we are not at all stylish. The bags on the Kingpin Deluxe are too small for our needs. The bar-mounted windshield is surprisingly effective. My Darien remained dry through the drizzle. I experienced some helmet turbulence and wished the screen were taller. There is about 4 inches of vertical adjustment to the screen, but I didn’t touch it for fear of marring the chrome fasteners. Note that a socket or wrench is required to adjust the height. I also noticed that I could find calmer, quieter air if I leaned forward. Normally, I would slide forward on the seat, but the deeply dished seat prevented this. This brings up my biggest beef about the Kingpin – the seat. The dreaded market research dictates a low seat height. In order to reach this objective, Victory lowers the frame and dishes the seat pan. While this design permits those with the shortest inseam to reach the ground, the deep scoop shape prevents you from sliding forward or back, effectively locking you into one position. I would consistently start to switch cheeks after about 150 miles. Perhaps firmer foam would help. We never want to see a manufacturer sacrifice function for style. What good is a bike if you can’t ride it? No matter, Victory offers several different seats, as does the aftermarket. Other touring amenities include matching polycarbonate windshield lowers and a passenger backrest. I didn’t remove the lowers for an airflow comparison. My riding pants did stay dry at the knees during the drizzle. Suffice it to say that the lowers help divert rain. The backrest is typical cruiser fare. It looks good but is non-adjustable. Nice if it fits your body, but tough luck if you are not an “average” passenger. Both rider and passenger get hinged floorboards instead of footpegs. The rider’s boards have non-replaceable cast ridges that scrape first. Repeated cornering shenanigans will send you back to your dealer for full replacements. The passenger’s boards fold up when not in use and are styled to complement the long, low lines of the Kingpin. Cruiser owners love their chrome and Victory does not disappoint. Factory accessories are a nice cash cow for both the manufacturer and dealers and Victory delivers the freight. Chrome footpegs, crash bars, forks, swingarms, baubles and bling are yours for the asking, along with seats, saddlebags and windshields. Victory has repositioned itself as “The New American Motorcycle.” The Victory Kingpin Deluxe features their all-new motor with modern technology and is one damn fine bike. It has excellent reliability and the highest buyer satisfaction of any motorcycle manufacturer today. At MMM we like to ride, and like bikes that can be ridden. If you are looking for a V-twin cruiser that can go the distance, do yourself a favor and check out a Victory Kingpin Deluxe. King Kong: 100/6 churns out fantastic power. Improved gearbox. Heel-toe shifter that actually works. Lusty fuel consumption when ridden hard. Diminutive bags.